In the middle CHICKEN DELI Founder Roseller Ciocon with family, friends and staff at the branch opening in SM Santa Rosa, Laguna. True to it's slogan, CHICKEN DELI has finally arrived in the south of Manila. Chicken Deli took the south by storm literally! 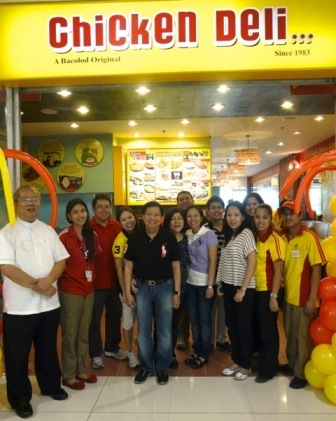 Chicken Deli launched its latest branch last Sunday, September 16, 2012 at SM Santa Rosa, Laguna. 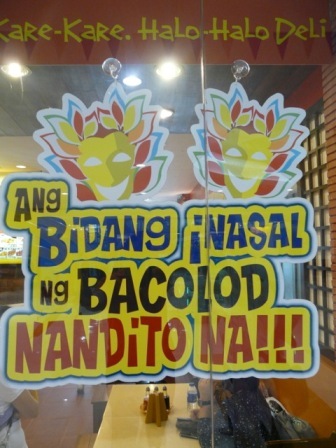 The new branch was flooded by Inasal fans on this rainy day who wanted to get a feel of the Inasal craze and to grab a taste of that popular and delicious Chicken recipe from the festive City of Bacolod. The simple and intimate store blessing was attended by close friends, family and Chicken Deli store owners that came all the way from Bacolod. As soon as the kitchen started grilling their famous original Inasal dishes, Sunday mall visitors started pouring in the restaurant from kids, teens, old timers, friends and family! Chicken Deli caters to all and offers everyone that enters its doors a satisfying smile on their faces and a reason to look forward to for their next visit. Chicken Deli started as a simple dining enterprise in the City of Smiles with a simple desire to serve deliciously flavourful food. This humble restaurant was soon poured in with locals and tourists to experience the taste and enjoy the best quality Chicken Inasal. Soon after, it became a perfect location for families and friends who are looking for a nice hang out place to eat and bond. The restaurants fame was brought by its delicious food, quick service and affordable prices. Just recently this year, Chicken Deli was dubbed as one of the Top 10 Chicken Inasal restaurants here in the Metro by Spot.ph. Certainly, Filipinos are taking a big hit from the Chicken Deli whiff.